5793 labyrinths found. Showing 4921-4940. Sorted by country, state, city, then zip/postal code. Parking available at Goodall Environmental Studies Center. Labyrinth is approximately 200 yards down gravel path. Path closes at sundown. Five-circuit Chartres style with 3 foot wide paths. Please sign in at the school's office during school hours or when children are present. The labyrinth is a 5 circuit classical labyrinth built on top of a turtle base. 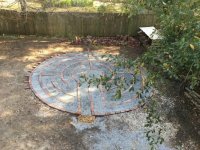 Additionally there is a path all around the labyrinth on the shell, making it a natural place for gathering in a circle. A small step assists those who need it onto the shell on the right side, nearer the school. Beth Langley, Linda Brashier and Linda's Upper Elementary Montessori class. 34 37' 16.00" N° Lat. ; 82 7' 26.00" W° Long. Christ Church owns a "Petite" Chartres, 7 circuit, labyrinth. It is available for rent locally by request. The labyrinth is on the greenspace in front of the lower school. Visitors are welcome to enjoy this sacred space of the campus. Please check in at the office during school hours. 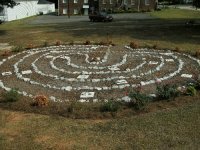 The labyrinth is a Chartres replica with a celtic cross incorporated into the design by using two colors of stone. The darker stone is used for the cross and ninth circuit and extends to form an entry at the mouth of the labyrinth. Located behind Daniel Memorial Chapel. On the campus of Furman University. Located in church yard behind church. The greater garden area that is shared with Dunean Baptist Church also features: WWII Memorial Plaque (1945) in memory of 13 Dunean men killed in WWII; Community Christmas Tree (2008) Carolina Sapphire Blue Spruce; Marker and Memory Walk (2011) in recognition of the 100th anniversary of the Charter of Dunean Mill and Village. There is a Medieval garden here that is a replica of one in Germany. Approx. 4 miles from downtown Greer on Hwy 14S. 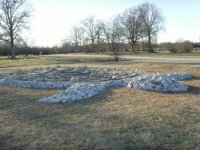 In addition to the labyrinth, Springbank also has a "Cosmic Walk" that marks Earth's geological history as you meander along one of the many wooded paths. It is open during daylight hours, but please call ahead to schedule your visit. Springbank Retreat is a unique center for Eco-Spirituality and the arts located on 80 acres of natural and beautiful land, intersected with wooded trails. A 1200 year old live oak, the revered "Grandmother Tree" graces the property. This is a seven circuit labyrinth in a natural setting with paths defined by plantings and a few engraved stones. This is an indoor labyrinth and is only stored at this location. Labyrinth may be rented out to sites with enough room to accommodate a 30' labyrinth. Across Fort Street from the city and county administration buildings. Open as scheduled for special events. Wide paths between walls of grasses and other plantings give the labyrinth a natural and peaceful feeling of seclusion without diminishing the airy openess of the rural setting. Mepkin Abbey is full of history. Take a day to appreciate it all. Beautiful gardens and statuary, a store full of wonderful beauties and edibles, including eggs from their working farm. The labyrinth is large and even though fall perennials make early October the peak season, it is lovely anytime. The Abbey is closed on Thanksgiving, Christmas, and Easter. The Store is closed on Mondays, but open Tuesday-Saturday 9am - 4pm and 1pm - 4pm on Sunday. 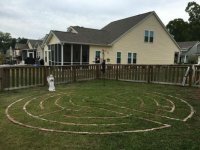 The labyrinth is a "Heart of the Chartres", with seven circuits, beautifully landscaped with wide grassy paths and walls of fall blooming perennials. The walk in to the center is one-half mile. Located in the backyard of the home. Access the labyrinth by entering in the gate of the fence. Holly Bendz, The Heart Centered Labyrinth Co.
Holly Bendz, The Heart-Centered Labyrinth Co. Located behind the building in the backyard. While the labyrinth is wheelchair accessible, the path is 16.5" and made of brick and gravel. Holly Bendz of The Heart-Centered Labyrinth Co.